We know that Australia’s waters contain lots of tiny pieces of plastic, and that these pieces can harm many marine species. But in new research published today we show that these microplastics are also home to marine life, some of which could be helping to clean up the oceans. In earlier research reported on The Conversation we found Australia’s waters contain around 4,000 plastic pieces per square kilometre. Since then we’ve been looking at the tiny lifeforms found on tiny plastic, in the first Australian study of its kind. Our results are published today in PLOS ONE and data repository Figshare. Our growing plastic production and waste, the obstacles to recycle and properly discard plastic products, and the sharp rise in the number of ships and coastal developments, are all leading to an increase in the number of plastic items being lost or discarded at sea. Ocean plastic debris, such as throw-away packaging and fishing gear, breakdown into progressively smaller pieces mostly through the effect of heat and sunlight. As a result, most of the plastic floating on our oceans are fragments less than 5 millimetres across – the so-called “microplastics”. Tiny plastics are widespread across all oceans, with hotspots occurring at surface waters of the Mediterranean Sea and at large oceanic areas known as “garbage patches”. Plastic concentrations at these hotspots can exceed 100,000 pieces per square kilometre. Ocean plastics contain harmful substances that come from the plastic itself and from oily pollutants that stick to their surface. Plastic toxins can be carried across marine regions and transferred from ingested plastic to animals such as tiny fish and whales. Microplastics can also physically hurt and kill small ocean creatures, such as baby turtles and invertebrates. They also transport ocean-going creatures to new habitats, potentially impacting local ecosystems. Scientists first discovered that microplastics are home to life in 1972, when two Science papers reported microorganisms living on 0.1-5 millimetre long plastic from coastal and oceanic waters of the North Atlantic. Further at-sea studies on plastic-dwellers only emerged in the 2000s. A pioneer study analysed six plastic pieces from the North Atlantic and found a diverse and complex community of microbes. The researchers called this realm of life the “Plastisphere”. These plastic-dwellers seem to play important roles in determining the fate and impacts of plastic pollution. For instance, they appear to modify how fast plastics break down and the buoyancy of plastics. Pathogens such as viruses may also inhabit debris and infect animals that ingest the plastic. But we still know very little about the dwellers of the widely-dispersed and abundant millimetre-sized microplastics. Aiming at improve our knowledge of tiny ocean plastic-dwellers, we decided to take a closer look at 68 plastics we collected in waters from around the Australian continent using a powerful microscope called a Scanning Electron Microscope. Sampling locations of the 68 plastics analysed in our study. 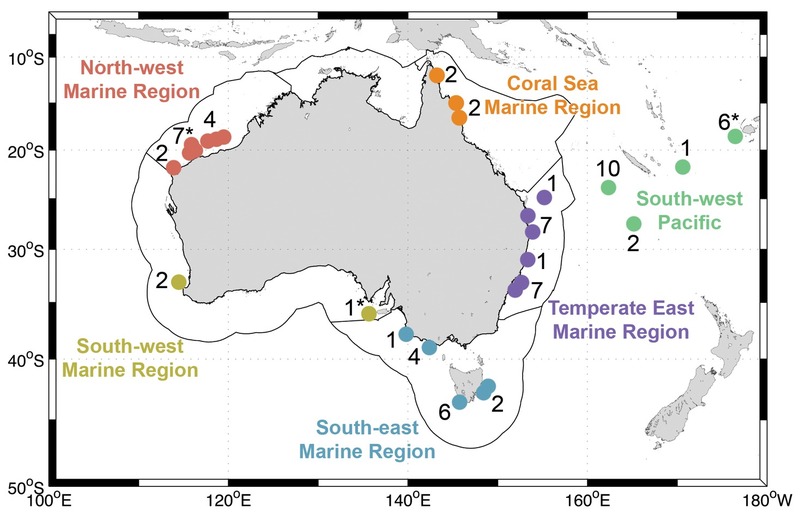 Black lines delimit marine regions of Australia; dots indicate areas where plastics were collected; numbers represent how many plastics were taken for scanning electron microscopy analyses. The tiny plastics we examined had a broad range of surface textures that formed tiny ideal habitats for many species. Every piece we examined, which were between 1.5 and 24 millimetres long and made of polyethylene and polypropylene materials, were harbouring a number of lifeforms from a variety of species. 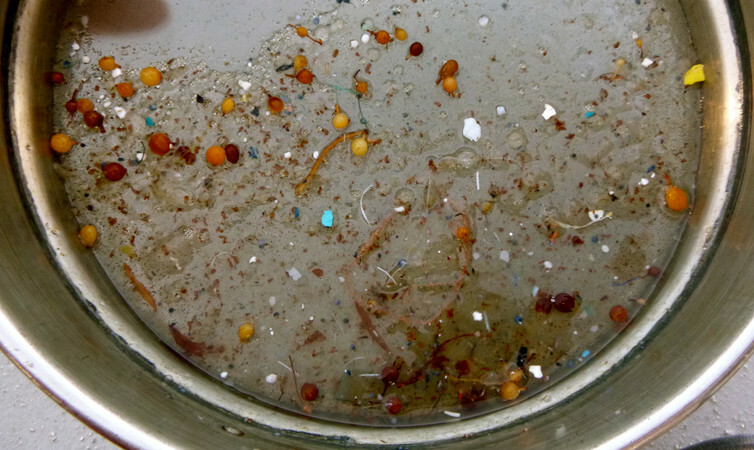 Our study shows that these microscopic plastic-dwellers are everywhere in our oceans. Creatures ranging from single-celled microbes to invertebrate animals are all taking advantage of this new human-made type of floating habitat. Surprisingly, we found a few tiny animals on the plastics we examined. These included bryozoans, barnacles, a worm, an Asellota isopod, and eggs of the sea-skating insect Halobates. 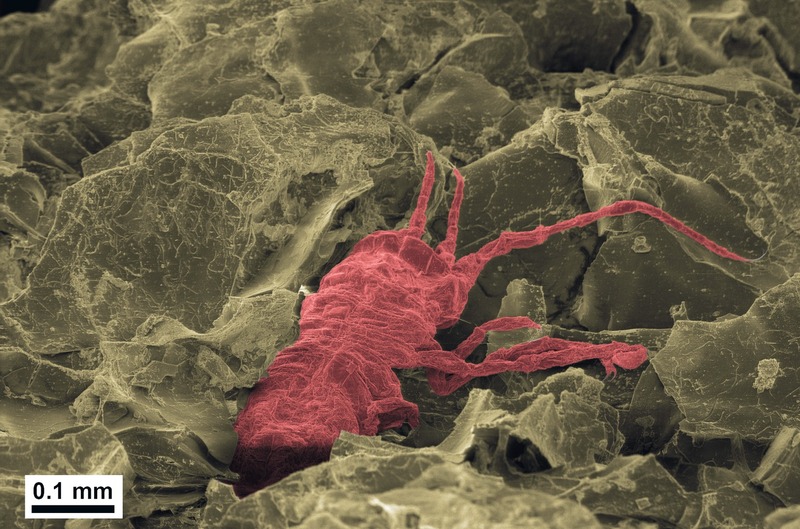 False-coloured electron micrograph of an isopod on a tiny fragment of Styrofoam cup. 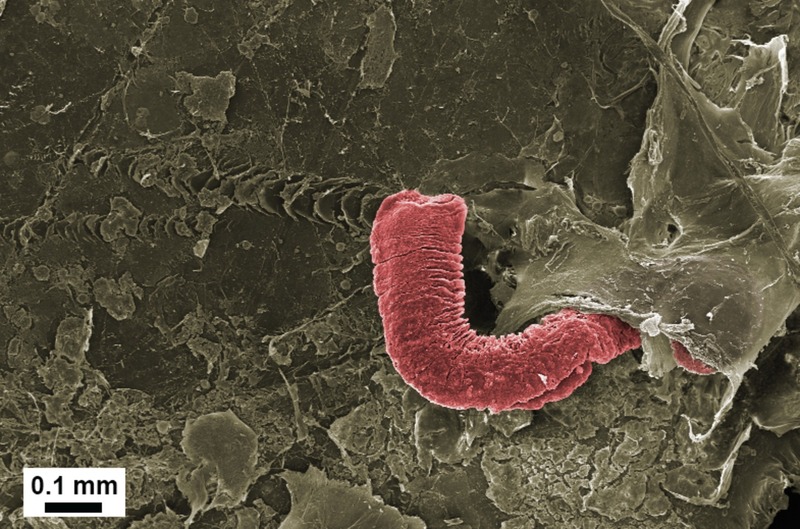 False-coloured electron micrograph of a marine worm on a 6mm plastic fragment (polyethylene). Even though plastic-dwelling animals are less frequent and diverse than those living on large marine debris, ecological implications of this phenomenon may still be significant. For instance, tiny plastics are giving sea insects a place to breed out on the open ocean. Our study also provided the first identifications of coccolithophore species attached to plastic. These are tiny algae enclosed by calcium carbonate plates that inhabit the sunlit zone of the ocean. Interestingly, we only observed them on plastic debris from southern Australia. As such, further studies in Australian temperate waters may help better understand this unusual coccolith-plastic relationship. 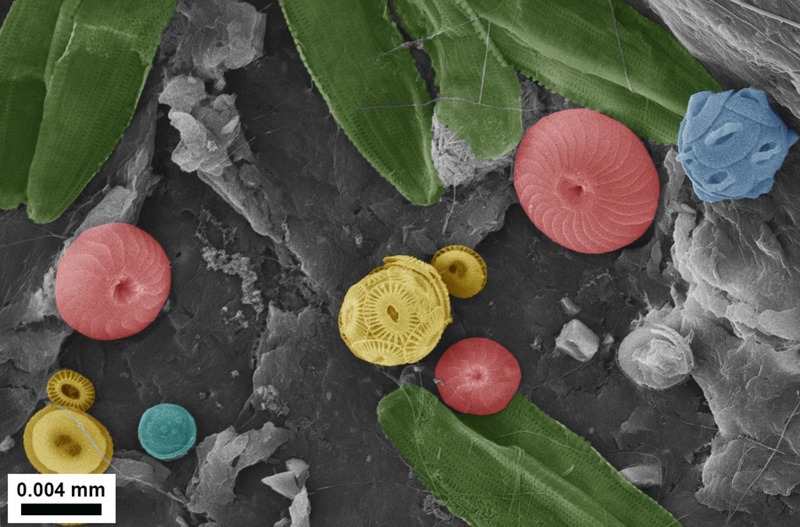 Coccolithophores and diatoms on the surface of a microplastic from South-west Australia. We also found evidence to suggest these tiny creatures can have big impact on what happens to plastic in our oceans. Diatoms, which are tiny algae enclosed by a heavy capsule made of silica, were the most diverse and abundant group we observed. With the help of Prof. Gustaaf Hallegraeff, we were able to identify 14 diatom genera living on the tiny plastics, of which 11 were new records of plastic-associates. 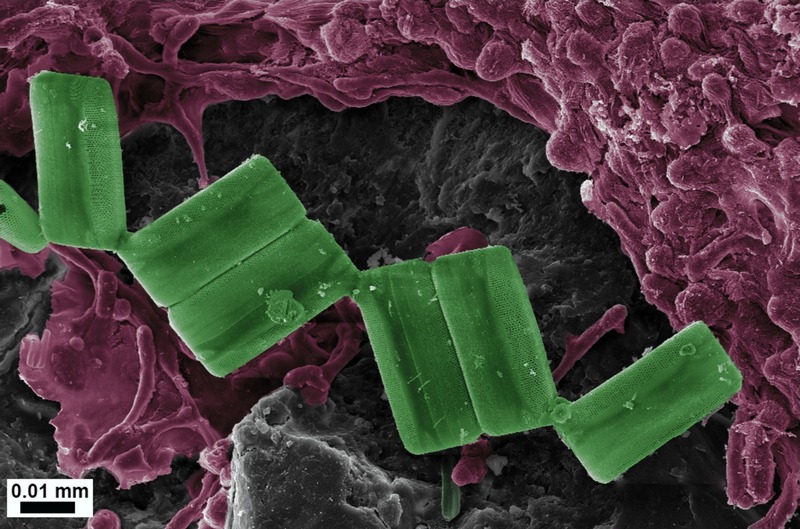 Diatoms (green) and potential ‘plastic-eater’ microbes (purple) on a tiny plastic debris. These diatom species are known to live attached to natural hard substrates such as sediments, rocks, and vegetation. Marine plastics thus create a new, floating habitat for these organisms, in a perfect light-filled environment. Because of their rapid growth and production of nutritious substances, these diatoms may provide food to some marine animals. As their plastics hosts can contain toxins, it remains unclear if such feeding activities would have a positive or negative impact on the animals involved in this new type of food web. Diatoms growing on ocean plastics may also decrease the amount of plastic at the sea surface. Large numbers of these silica-forming algae can weight down their plastic host, potentially causing tiny pieces to sink to the bottom of the ocean. Such a “plastic sinking” process could be one of the reasons why the plastic load floating in the ocean is not increasing as much as expected. Many flourishing microbes appear to interact with the plastic surfaces we examined. These observations, together with findings from previous studies, suggest that microbes are helping to break down plastics at sea. This could be another explanation for the less-than-expected level of plastic pollution at surface waters. Plastic-eating microbes may also support biotechnological solutions for better plastic waste disposal practices on land. Perhaps in the future, we may come up with industrial “composts” that can break down our plastic waste.